Flying the Friendly Skies - Disney's Planes takes off thanks to a crowd-pleasing storyline and colorful cast of high-flying characters. The Battle for Smurfette's Soul - The Smurfs 2 director Raja Gosnell and animation director Richard Hoover spill the beans on the trials and tribulations of bringing the little blue creatures' second big cinematic adventure to life. 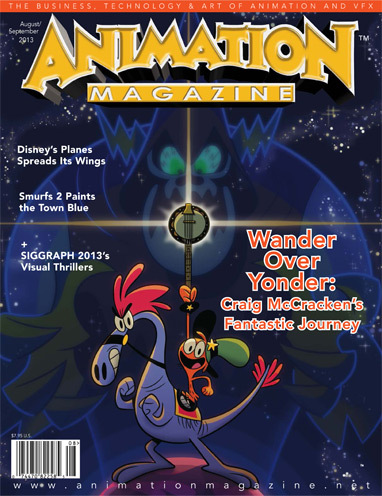 A Walk on the Bright Side - TV animation auteur Craig McCracken chats with us about the challenges and rewards of his charming new Disney Channel show, Wander Over Yonder. Hulk to the Power of Five - Expect lots of larger-than-life dilemmas, plenty of action and dysfunctional family jokes in Marvel's new series Hulk and the Agents of S.M.A.S.H. for Disney XD. Planes, The Smurfs 2, Wander Over Yonder, Hulk and the Agents of S.M.A.S.H., Pacific Rim, Game of Thrones, SIGGRAPH 2013 and much more!